Adventure pool Acquarena – Fun in any type of weather! The indoor pool Acquarena offers approximately 12,000 m² with swimming pools, a fitness facility and an expansive spa complex. 365 days a year, a waterslide, a flow channel and a 25-meter lap pool await you here. There are special pools for children, equipped with slides. On warm days, you may also enjoy the sun outdoors. The outdoor area offers a diving platform, a volleyball court and a beach soccer field. 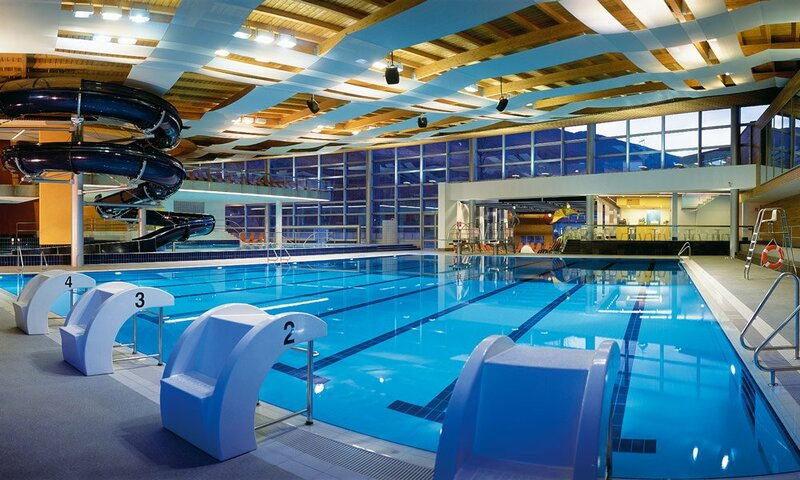 The 50-meter pool allows you to swim long laps. Small kids have fun at the children’s pool, and on the greens you can play ball and relax. In summer or winter – the 1,200 m² sauna area is always open. In various relaxation rooms and six cabins, you may leave your everyday worries behind. A special experience is offered by the herbal sauna: The cabin is operated at moderate temperature and humidity. This way, the airways are freed and the skin is smoothened; at the same time, it stimulates the metabolism. Furthermore, at the indoor pool Acquarena you may also enjoy the advantages of a traditional Finnish sauna.